DRUM, DANCE & SING... with master drummer Kwasi Dunyo from Ghana, West Africa. Discover the excitement and joy of traditional Ghanaian styles of music and dance. Let Kwasi Dunyo introduce you to a culture whose people share freely in their joy of the music. 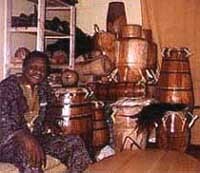 Kwasi was the lead drummer for Sankofa Dance Theatre from 1977 to 1981 where, under the tutelage of Godwin Agbeli, he learned much of his repertoire of Ghanaian music. In 1992, Kwasi Dunyo was the recipient of a Visiting Foreign Artist grant from the Canadian government which provided the basis for his first trip to North America. Kwasi's open and generous teaching style, and his love of the music has earned him many praises. Kwasi is the member of the faculties of York University, University of Toronto, Royal Conservatory of Music and the Toronto District School Board. He has also performed and given workshops at many Canadian and American universities including the University of Alberta, University of Saskatchewan, Guelph University, University of Waterloo, University of Western Ontario, McMaster University, Brock University, Memorial University, University of Virginia, Tennessee Technological University, and William and Mary University. Kwasi has taught in public schools in Ontario and Virginia, he took part in a Sound Symposium in St. John's Newfoundland in July 1992, and performed at Toronto's First Night in 1996 and 1997. Kwasi is now a member of the Society of Ethnomusicology of North America. Here's Kwasi's current curriculum vitae. WORKSHOPS... Kwasi has conducted African drumming and dance workshops for children and adults all over North America. Click here to find out more. INTO THE SOUND OF THE DRUM... The ultimate drumming experience! Learn, hear, feel and experience the sound of the drum at the places were drums were born... in Africa! Click here to find out more. CD and BOOK... In Ghana, music brings people in the community together. It is part of all life, and within the music community each person is considered equal. The various rhythms in the music make a statement, interacting and responding to each other. Kwasi's personal belief is that music is a spirit  a most wonderful precious and happy spirit  given to everyone by the Creator before they were born. Each person has music within them and it needs only to be developed. 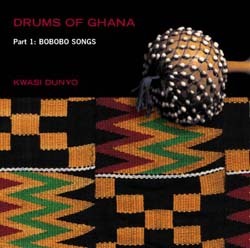 With Songs of Ghana and Drums of Ghana Kwasi makes it possible to realize the spirit within through listening to, singing and playing the music of Ghana. Vol. 1: Bobobo Songs (book). Bobobo means to bend over, lean over or get down and refers to the body movements of the dancing. These songs are from a large recreational piece called Bobobo. 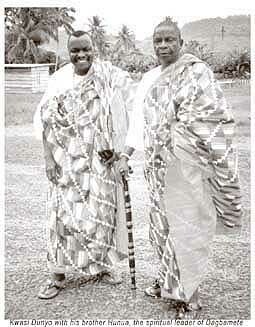 Since they are part of the aural tradition of Ghana, there can be no perfect transcription. There are many interpretations of the songs depending on the region where they are sung and who is performing them. The written format presented represents Kwasi's personal interpretation of eight songs, complete with phonetics, translation and music of each. Coilbound. 17 pp. Part 1: Bobobo Songs (CD). 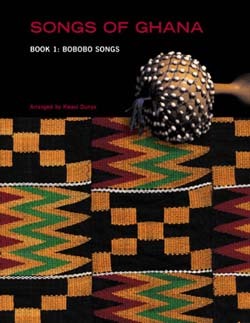 Companion CD to the book Songs of Ghana: Bobobo Songs. 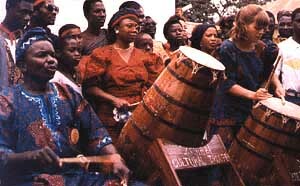 Each of the songs is performed with traditional gankogui and axatse instruments and with the large drums of Ghana. Kwasi Dunyo performs eight Bobobo songs accompanied by vocals. The drum tracks of the same eight songs are repeated alone. The songs on this CD are: Mie Le Ago Dom Na Mi, Mie Va Do Lo, Gbe Si Gbe Ma Ku La, Bobo Mia Do Dali, Lolo Nye Hafi Na Dzo La, Agama Gble Menye, Devi Sue De Me Nye, and Novi Lolo. Click on the link to play a sample track (Novi Lolo). VIDEO ARCHIVE... Watch videos of concerts and workshops from Kwasi's video archive. ADZENA FUND... Help the kids in Kwasi's village in Ghana go to school. Click here to find out how to sponsor or child or help build a school.